Faux is skillfully rendered painting which deceives the viewer, giving an illusionary appearance of reality. Trompe L’ Oeil means literally fool the eye, and Faux means false. The decorative finishes include Venetian plaster, stone, marble, granite, wood, leather, gold leaf, glazing, three dimensional effects and many more. Murals are narrative or abstract paintings on walls; frescoes. They are widely used both in private homes as well as commercial spaces, spas, offices, restaurants etc. They create another dimension, an illusion of space as well as provide visual interest. We offer a wide array of options for your convenience murals can also be painted on boards, on canvas or other materials of your choice. “Owls with Talking Eyes” is a bronze sculpture on permanent display at the Cathedral of St. John the Divine. As a winning entry in the Animals of Freedom sculpture contest, it is a part of the Peace Fountain representing the power of Good over Evil. “Dance of Life” is a 10 foot metal mobile sculpture on permanent display at Joan and Alan Bernikow JCC, 1466 Manor Road Staten Island, New York. In 2007 it was awarded the prestigious Buildings Award. Diana loves to paint in different mediums, such as oils, acrylics or watercolors; she will personally create a masterpiece for you. Portraits, landscapes, abstract art and many other options are available. Sketches and custom projects are welcome and priced upon request. Diana’s Murals and More frequently takes on challenges such as landmark restoration, various three dimensional installations, design of unique furniture pieces, custom design of unusual architectural spaces, custom gifts, color consultations and more. Unique designs are frequently created to suit the clients’ needs. Diana Sorkin is an Accomplished Certified Teaching Artist, with residency experience at elementary and intermediate school levels, with a focus on visual art. 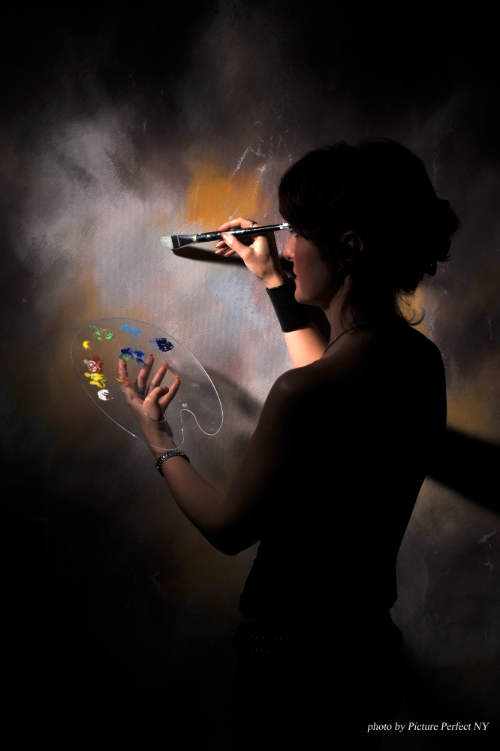 She uses basic creative techniques to accomplish hands – on interactive learning to produce murals and other tangible visual projects for temporary and permanent installations. If you, your family or your organization have aspirations of creating a mural for your space, Diana Sorkin will guide you through the process. You will be able to design, create and bring your vision to life under the supervision of an accomplished professional. This unique experience builds teamwork, confidence and an appreciation of beauty. Feel free to contact us with your unique project ideas. We gladly accept Checks and Credit Cards.